Do we treat Seborrhoeic Dermatitis and how successful is treatment? Yes. Treatment for seborrhoeic dermatitis consists of clinical and home-use treatment and helps to clear up the condition. 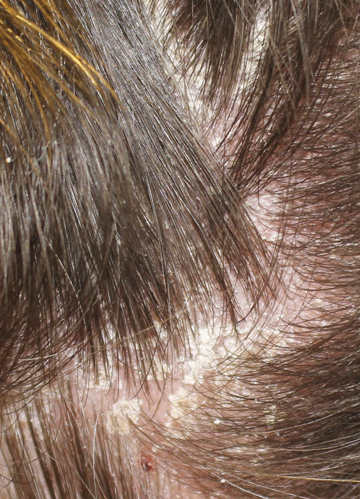 Seborrhoeic dermatitis, often referred to as ‘SebDerm’, is an inflammation condition that is seen as areas of redness covered by large, yellow, greasy scales, which may be diffusely spread over the scalp. Seborrhoeic dermatitis can extend beyond the margins of the hair onto the forehead, behind the ears and onto the posterior neck. Scaling and redness may be seen in the beard, ears, naso labial fold (both sides of nose), chest and groin. Seborrhoeic dermatitis is associated with oiliness, which is caused when sebum is acted upon by the yeast, pityrosporum ovale, which is found in the skin. This results in itching, scaling and redness. Scaling or a dry scalp described by most people can in fact be caused by oiliness. The cause of seborrhoeic dermatitis is unknown but a genetic factor is certainly implicated. Androgen production plays a part, which occurs in infants with cradle cap who are under the influence of maternal androgens, and re-appears later in puberty when sebaceous activity has been re-established. The severity of seborrhoeic dermatitis varies from one individual to another. Lifestyle factors such as stress and dietary factors may also cause the condition to flare up. Treatment of seborrhoeic dermatitis is directed towards reducing both the scale and inflammation. Frequent (daily) shampooing is essential and the amount of time that the medicated shampoo stays on the scalp is less important than the frequency it is used.